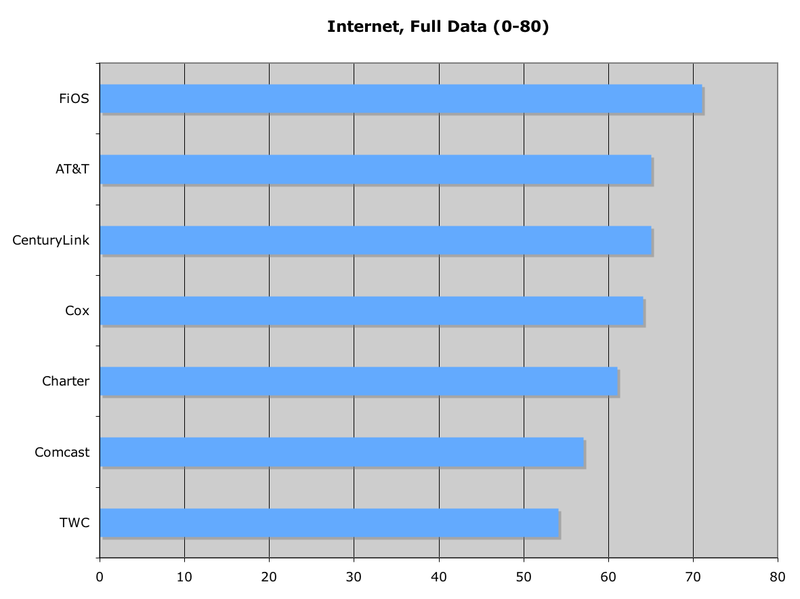 If you live near one of the few areas in the country in which Verizon actually operates its FiOS network, you might have seen one of the ads where a Verizon FiOS shill asks “America” to look at a charts claiming to show customer satisfaction results for the nation’s largest Internet and pay-TV providers. 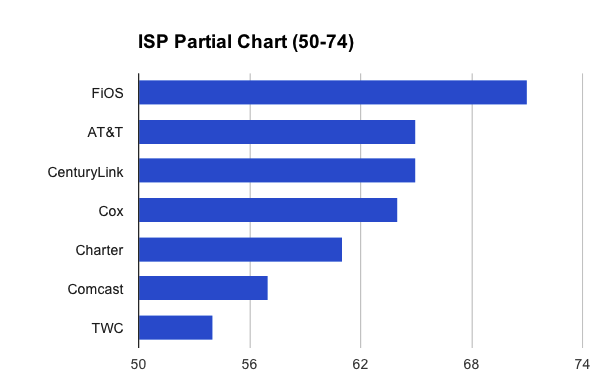 Looking at those chart, it appears that Verizon is blowing the competition smithereens. The reality is not as dramatic, graphically speaking. Wow… FiOS is really far out in front! Customers must frickin’ love these guys, right? And since these ads are specifically targeted at bottom-dwelling Comcast and Time Warner Cable, we collapsed the charts to see just how much better Verizon is that these merger buddies. When we looked at the fine print for these two ads, we noticed that the Internet one is using ACSI data from 2014, but the pay-TV ratings are from 2013… Why could that be? 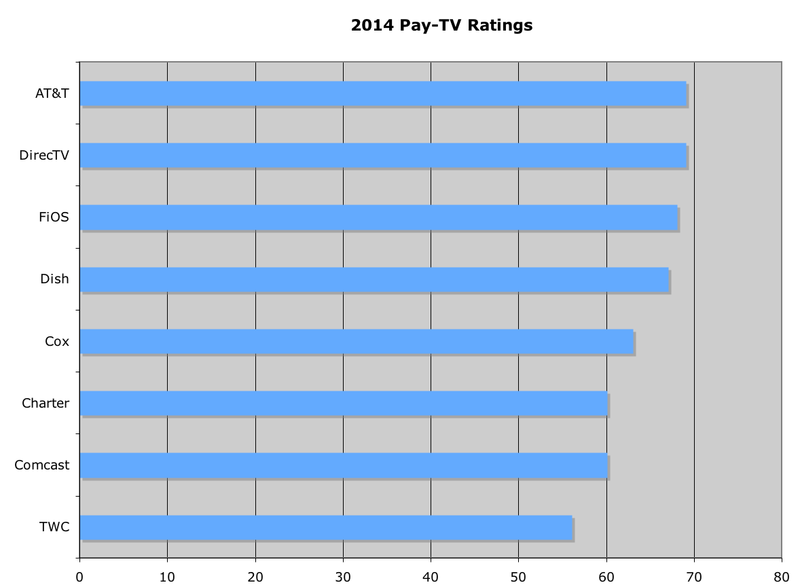 That’s because FiOS is no longer the top-ranked pay-TV provider by ACSI respondents. 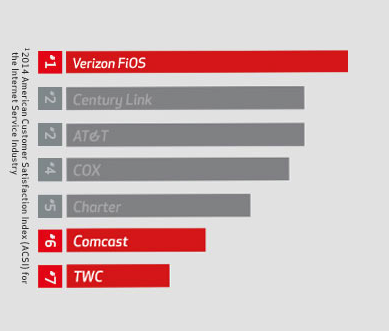 In fact, according to the 2014 data for this industry, FiOS has dropped to third behind AT&T and DirecTV. But something else is strange about this chart, other than the fact that Verizon is now barely eking out a bronze medal in front of Dish. It seems like the gap between the industry leaders and the worst of the bunch is nowhere near what the Verizon ad made it out to be. You know how it’s sometimes hard to see differences between a group of similar objects when you’re looking at them from far away? But then you move closer and the differences become more apparent. 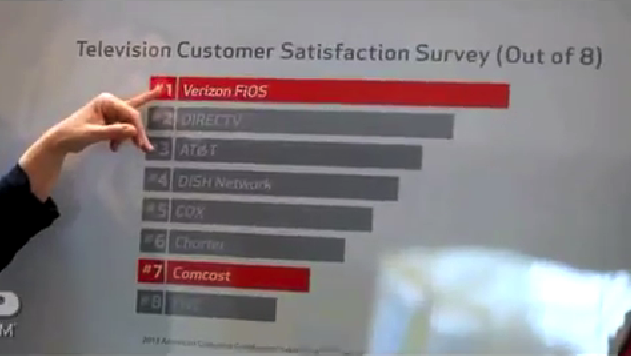 It looks like Verizon decided to do this with the ACSI charts in order to give viewers a false impression of its dominance in the customer satisfaction rankings. As we showed above, the charts in both ads tell a story that Verizon is at least twice as satisfying to customers than either Comcast or TWC. But, monkeying around with the chart, it looks like Verizon zoomed in to only cover a segment of the data — without revealing that the chart doesn’t start at 0, but more likely around 50. By zooming in, Verizon maximizes the visible differences between the scores, glossing over the reality that the rankings are much more clustered than the chart in the ad implies. One thing you’ll also notice about the charts in the Verizon ads is that they lack any sort of numbering — other than the rankings. Not only does this allow Verizon to give TV viewers the impression that Comcast and TWC’s scores are much worse than they are, it also lets Big V hide the fact that its numbers aren’t so impressive. This chart, a copy of the one of the TV ads, is on the FiOS marketing site without any explanation of the data manipulation involved. Showing that the ad charts actually begin at 40 or 50 instead of 0 would have revealed the chart to be a big fib. Making matters worse, the company continues the lie over on this website that it touts during the TV ads. Here’s what makes all these attempts at visual deception and exaggeration so unnerving: Verizon didn’t need to do mess with these charts. The company is indeed far ahead of the rest of the industry on the ACSI Internet rankings; it’s the only one of the ISPs on the list to score above a 70, and it’s done so for two years in a row. While that’s not a blazing-hot number, it is about the best you’re likely to ever see from an ISP. And Comcast and Time Warner Cable do indeed stink like a scared skunk. Their scores are among the worst of all companies ranked by ACSI — not just the cable and ISP industries — and are so far in the rear that the difference between the bottom and top scores is apparent without zooming in.